Microchip Technology Inc., a leading provider of microcontroller, analog and Flash-IP solutions, announced its Digital LED Lighting Development Kit. LED lighting designers are being challenged to meet the rapidly expanding demand for green, smart energy technologies while differentiating their products. 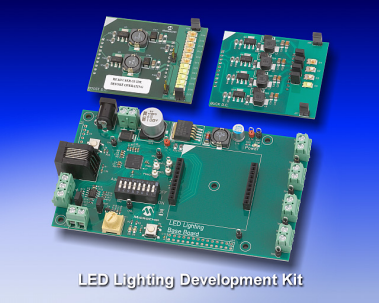 Microchip’s Digital LED Lighting Development Kit enables designers to quickly leverage the capabilities and performance of the dsPIC33 ‘GS’ series of Digital Signal Controllers (DSCs), to develop LED lighting products. The dsPIC33 ‘GS’ DSC and this reference design allow developers to create a 100% digitally controlled ballast function, while including advanced features such as dimming and color hue control. The dsPIC33 ‘GS’ DSCs can support an entire system implementation for LED lighting products, including power-conversion circuits, such as AC-to-DC and DC-to-DC conversion, along with functions such as Power Factor Correction (PFC), which are necessary for a complete product and lower the overall system cost. LED lighting applications supported by Microchip’s LED Lighting Development Kit include dimmable LCD backlighting, signage, LED replacement of fluorescent tubes and incandescent bulbs, architectural lighting, and automotive lighting applications. Automotive lighting products include exterior applications, such as headlights, daytime running lights and signal lights.